Explore with us the culinary specialties of the Swabian cuisine. 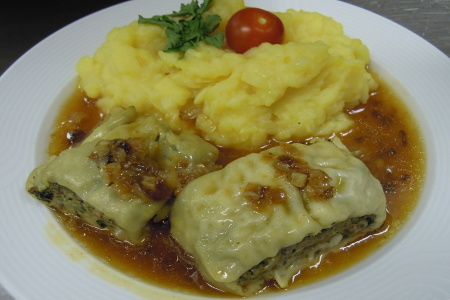 We would like to invite you to enjoy an original Swabian dinner: Maultaschen (dumplings) with potato salad. Non-alcoholic drinks and an vegetarian alternative of the “Maultaschen” also will be available and we are already curious how you will like this local dish, which is also called “Herrgottsbscheißerle” in the Swabian dialect. So step by – we are looking forward to welcoming you! The last date of payment for this event will be our office hour on 22/10/2018, 12 pm. to 2 pm. at Clubhaus. There are 80 spots for this event.